THE VICTIM of a ‘brutal’ and ‘unprovoked’ attack in the city centre last week is appealing for information to help catch his attacker. 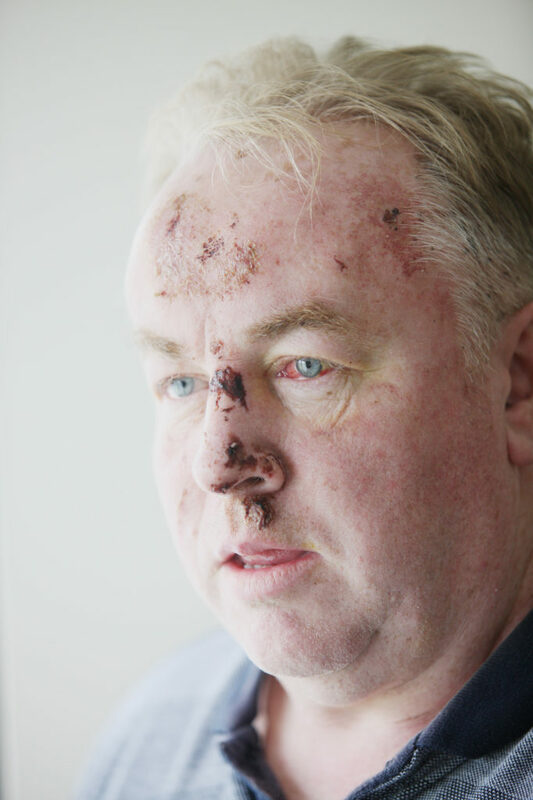 Paddy McGill, who lives in supported housing in the Whiterock area, was attacked around 1am on the morning of Sunday September 10. The attack has only now come to light. An unknown assailant attacked him from behind on King Street. Still shaken the 54-year-old told the Andersonstown News: “I headed into town with a friend for a catch-up as we hadn’t seen each other in about 20 years and after calling it a night we made our way to King Street and shouted for a taxi. “Next thing I got hit with something around the head, it was a merciful bang that sent me down to the ground. “As I got back to my feet I pulled my hands from my face and they were just full of blood. I was scared so I just ran off in a blind panic screaming out for help. I made it onto the Falls Road where I begged a passer by for help. The grandfather suffered a broken nose, numerous lacerations and a bite to the chest. He has branded those responsible “animals” urging anyone who may have witnessed the attack to come forward and help catch those responsible. “I want to warn people that this is happening and appeal to anyone who saw anything relevant to this attack to please come forward to stop it from happening to anyone else. “I don’t know why I was targeted, but people say drug use is rife in that part of town, so perhaps they were off their heads just looking for a fight. A spokesperson from the PSNI said police are appealing for information following the assault in the King Street area in the early hours of Sunday, September 10. Sergeant White said: “Police received a report at around 2.30am from ambulance staff that a man in his 50s had been assaulted and had sustained head injuries. He was taken to hospital where he was treated for facial injuries and other cuts and bruises. “It is believed that one male was involved in the assault and left the scene on foot with a number of other individuals.